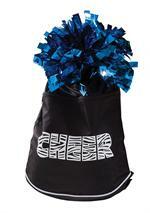 Pizzazz Deluxe Stringpack with CHEER on front in zebra print. Deluxe Stringpack in 6 solid colors. Minimum order 6 bags. Awesome Slingpack bag with megaphone design has iPod or MP3 player pocket & shoe shelf. 6 colors, minimum order 3 bags. 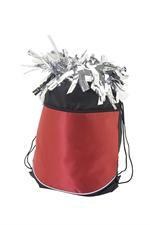 Pizzazz Mega-Star Travel Bag available in 6 colors, minimum order 3 bags. Cute zebra print stringpack bag available in 5 different colors. Minimum order 6 bags.